A beautiful antique French Louis XV style walnut armchair ‘fauteuil’, circa 1880 having the original finish and elegant carving on all sides with a generously sized seat. The subtle patina of the polished walnut on this antique French armchair is the result of years of polishing as well as hands and arms sliding across the surface. The gently curved arms are perfectly placed for comfort and the rake of the back encourages a relaxed posture. 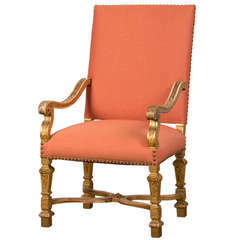 Because the carved details are visible even on the reverse of this antique French fauteuil (the term is French for an open sided armchair) it may be easily placed in an open seating arrangement where it will be visible from every direction. Louis XV style gilded fauteuil or armchair, 19th century. Fortuny fabric. 19th century French Louis XV Style giltwood armchair newly upholstered in a black, white and gray wave fabric. A French Louis XV carved walnut fauteuil from the Provence region of France from the 18th century.